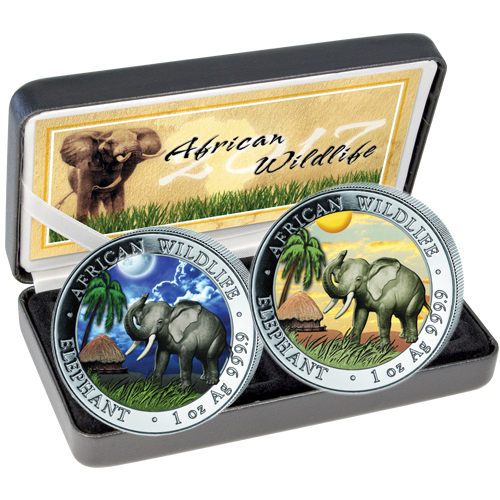 The Somalian Elephant Coins are some of the most popular bullion coins in the world. Each year, there is a different design gracing the obverse of coins, which makes them some of the most popular items to collect. One of the most unique items offered each year is the Day and Night Two-Coin Set. 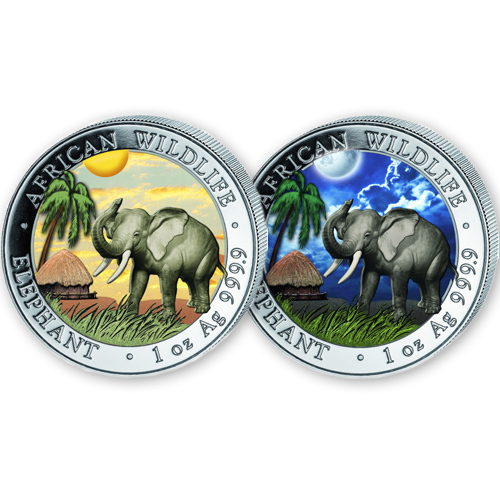 Now, you can get the 2017 1 oz Silver Somalian Elephant Day and Night Two-Coin Sets at Silver.com. Ships in a display box with a Certificate of Authenticity. Fourteenth release of the Somalian Silver Elephant Coins. Just 500 sets were produced by the Bavarian State Mint! Consists of two coins, each with one ounce of .999 fine silver in BU condition. Each coin has an individual face value of 100 Shillings (Somalia). Features the latest African elephant design in the series. Elephants are the largest land mammal in the world. These giants are found wandering the savannahs of Africa. Each year, Somalia releases new Somalian Elephant Coins to honor these great creatures. One of the special items released in the series each year is the Day and Night Two-Coin Set. This set features the year’s obverse on two different coins with differently colored backgrounds. 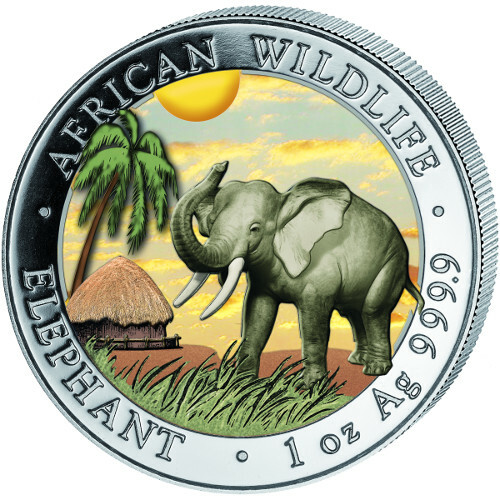 On one coin, the elephant roams the savannah during the day. The other coin shows the elephant standing under the moon at night. 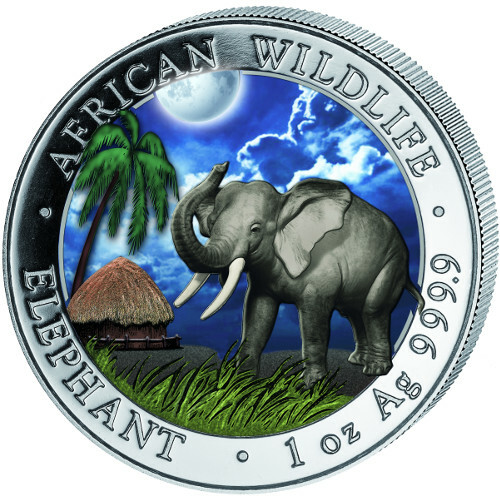 The obverse of each coin in the 2017 1 oz Silver Somalian Elephant Day and Night Two-Coin Set shows an elephant standing near a hut in the tall grass. On the day coin, the elephant stands under the bright sun in full color. On the night coin, the elephant is seen under the moon. Surrounding the image on each coin is the name of the series, the coin’s weight and the coin’s purity. The reverse of each coin bears the image of the Somalian Coat of Arms. The design includes the heraldic shield with a star set over a background of horizontal lines. Leopards surround the coat of arms and you can see the nation of issue, year of issue and face value. Each set is shipped to you in a display box and comes with a Certificate of Authenticity that verifies your purchase. These coins are minted at the Bavarian State Mint, which is located in Munich, Germany. The mint opened in 1156, and is one of Germany’s oldest mints. If you have questions for a Silver.com associate, you have three ways to reach us. You can call us at 888-989-7223, connect with us online using live chat, or email us.